In some ways something like Pixar’s latest short Piper is hard to talk about because it is deceptively simple. 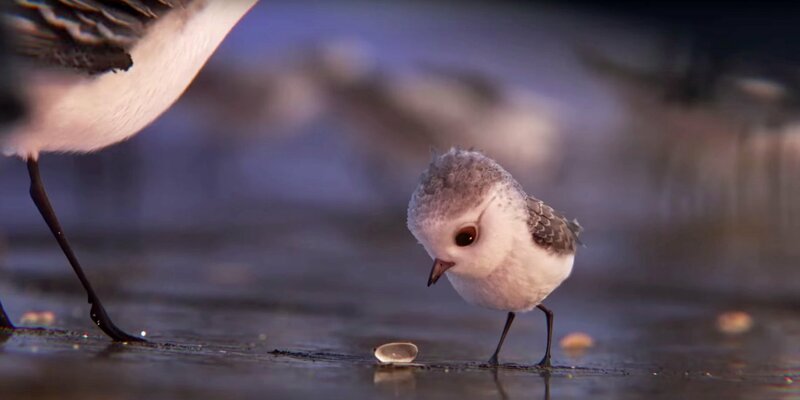 On the surface it is a cute little short about a baby bird at the beach but the more I thought about the more there was to it. 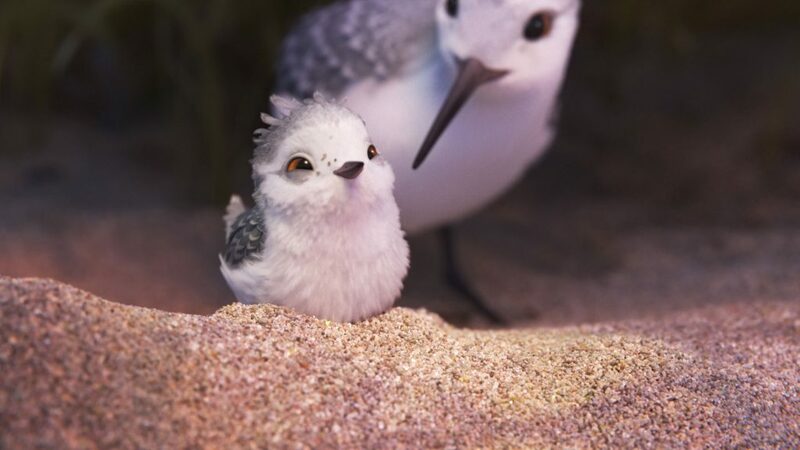 Piper is a real Pixar gem and one of their best shorts in years. Let’s start off with the animation. I think you can tell from the above photo that Piper is incredibly realistic. Most of the short if you hadn’t told me it was animated I would not have known. Everything from Piper’s feathers to her little legs looks so real. There is a little hermit crab that looks animated but the ocean and the water looks amazing. Little details like the way the water reflects Piper and the look of the sand are perfect. You can really see what they learned from the Good Dinosaur and took it into Piper and it makes me excited for future Pixar properties. Like I said, Piper is a simple story. 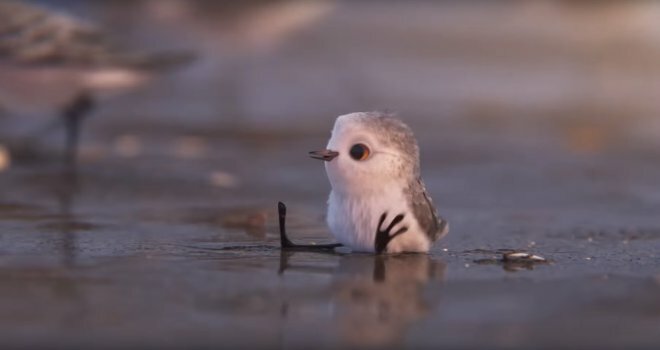 It’s about a baby bird who must learn to conquer its fears of the ocean. The thing that is great is it’s a valid fear. She (or he?) gets hit pretty hard with a wave and so naturally shrinks from it, not wanting to go near the tide. Unfortunately, she is hungry and finally her stomach rules the day, so she ventures back. With each new wave she is more scared until she looks under the water and see’s the world underneath. This new vision of the world excites her and helps Piper to overcome her fears. Composer Adrian Belew does a great job with the music in Piper and the whole thing is just completely adorable. I liked it so much I could see an entire Piper movie! Look at the detail in the above shot- the coarseness of the sand, the fluffiness of her feathers. Amazing! And it is winning without being too saccharine or sweet. What did you think of Piper? Where does it rank for you in the Pixar shorts? It will be pretty high for me although I love all of the Pixar shorts so it is tough. I posted my spoiler free review of Finding Dory on my youtube channel last night. I will post a detailed review here after I’ve seen it again, but just know it’s wonderful. I highly recommend checking out Finding Dory and Piper! If you guys could give this a thumbs up if you like that would be awesome. Thanks! I loved this short. Honestly, Pixar’s shorts are getting better each year. They really are. It’s amazing a short with no dialogue could be so affecting. I loved this short too….I consider myself to be a man’s man, but seeing this with my grandchildren, somehow made me think of how much we love our children and try to teach them things, then they grow up and are beautiful and independent. It just blessed me in a weird way. I thought the animation in “Piper” was FAR better than the animation in “Finding Dory.” My co-reviewer liked the movie far better than I did — I was totally let down and disappointed. Enjoyed your reviews! Oh too bad. What didn’t you like about it? I thought it was charming. But yeah Piper is so great! I will have a review of Finding Dory this weekend or Monday on the blog. Meanwhile, check out the youtube review. Awesome, will do! I was blown away by the animation in “Piper.” A very, very simple story but it looked GORGEOUS. That sand! The water! WOW! Hope I’ll like it too! I loved this short! It’s beautiful but also so sweet. And I think it’s probably the cutest Pixar short I’ve seen too. Just adorable. I feel that Piper is by far their best short to date. I was so moved by it. And of course it goes without saying that the animation was wonderful – truly enchanting. It is definitely top 3 if not the best. I love it so much.